Moreover, you’ll be giving your good gut bacteria more food to consume, helping them to be stronger than the bad bacteria nourished by sugar, alcohol, processed meats, refined foods, and sugar substitutes (to name a few). Fruits and vegetables are your biggest toxin fighters, and blood oranges add an extra punch during the winter months. It’s no surprise that blood oranges are high in vitamin C, fiber, several B vitamins including folate, vitamin A, calcium, potassium, and powerful phytonutrients, similar to their citrus cousins. Citrus, in general, brings some impressive nutrition to your body. Citrus fruits appear to helps to boost your immune system to fight illness, to combat cancer and cardiovascular disease, and possibly to help asthma sufferers. Red Grapefruit, for instance, is loaded with some impressive cancer-fighting compounds. 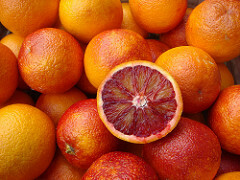 Blood oranges’ big bonus is the added benefit of anthocyanins in their red color. These powerful phytonutrients, found in orange-red, blue-purple colored fruits and vegetables like blueberries, add even more disease-fighting nutrients to blood oranges. Anthocyanins’ health benefits appear to be a result of properties beyond their antioxidant abilities, so they may even be more capable of fighting cardiovascular disease, blood pressure, and chronic inflammation. A lot more research is still needed to understand better how they work in the body, but there is enough research now to show anthocyanins disease-fighting attributes. When it comes to brain health, anthocyanins may also be helpful. These phytonutrients along with other phytonutrients may decrease inflammation in the brain, improve brain signals, and improve blood flow to the brain. In fact, some of these anthocyanins can cross the blood-brain barrier, having a more direct beneficial effect in the brain. Research suggests that the phytonutrient group of flavonoids, including anthocyanins, may enhance memory and help prevent age-related declines in mental functioning. Blood oranges require a period of cold to grow and develop their anthocyanins, so they are not available all year round like other oranges. They are, however, available in the dead of winter like January, February, and March when we need some extra disease-protecting nutrients. Eat half of your meals and snacks in fruits and vegetables for your daily “detox cleanse” and don’t forget to eat a variety of colors, including bright and dark colors. Blood oranges are a perfect winter fruit full of these powerful phytonutrients and lots of vitamin C to boot. Take February’s Healthy Challenge and eat blood oranges while they’re still in season. An orange a day may keep cancer away (and other diseases too). An orange has hundreds of different phytonutrients, many of which have been shown to have anti-inflammatory, anti-tumor, and blood clot-inhibiting properties, as well as strong antioxidant effects. Loaded with other nutrients as well, oranges add a great flavor punch to foods to brighten up the winter months.